In addition to Karen, the other speakers on the panel were an interesting mix of experts from various organizations. Moderated by Rebecca Busse, Senior Manager of Stakeholder Engagement for Future500, the panel included Marina Colby, Senior Advisor on Trafficking in Persons at USAID’s Center of Excellence on Democracy, Human Rights, and Governance, Tom Rausch, Co-founder and Product Manager for Labor Link at Good World Solutions, and Steven Price, Program Manager at the Forest Trust. With the pervasive environmental, social, and economic impacts of global supply chains and with an interconnected global economy, the panelists discussed challenges and effective solutions to bringing transparency into supply chains. The need to find solutions that are scalable is more necessary than ever, with accidents and fires in poorly maintained factories, substandard and inhumane working conditions, as well as forced labor and trafficking occurring at the raw commodity sourcing level. To get a birds-eye perspective of the best possibilities for systemic solutions, the panel spoke about their respective projects. Karen spoke about the moving trend in transparency tools towards emphasizing verification systems such as the Conflict-Free Sourcing Initiative which can make transparency more efficient and minimize costs for companies when compared to chain of custody tracking. Marina Colby emphasized her work in the role that technology can play in strengthening USAID’s Counter-Trafficking in Persons (C-TIP) Policy as well as help coordinate amongst other government agencies and stakeholders. Tom Rausch of Good World Solutions introduced Labor Link, a mobile platform that uses basic mobile phone technology to provide companies with real-time data from their supply chain. Steven Price from The Forest Trust discussed a dashboard designed to drive real-time transparency in the pulp & paper industry (forestry concessions), reducing deforestation and other environmental and social costs. 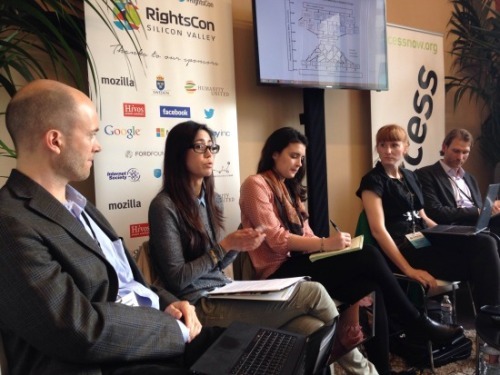 Over 700 attendees from more than 65 countries and 375 institutions attended RightsCon, including some of the world’s leading human rights experts, investors, corporate leaders, engineers, activists, and government representatives. You can watch videos of the conference at www.rightscon.org.